Morning sunlight shines through stained glass at Ansonia Christian Church, which has sat empty on Sundays since the church shut down its ministry Sept. 30. 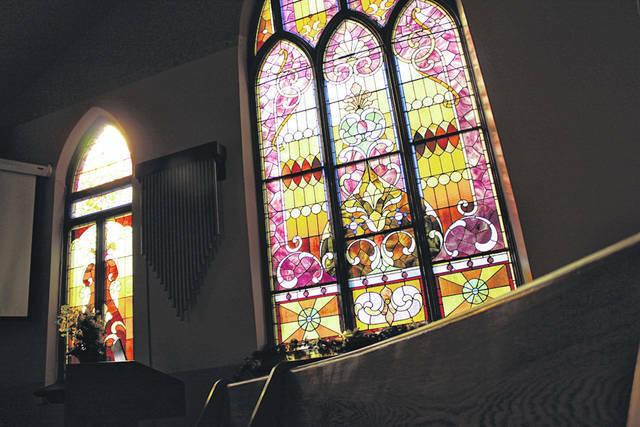 ANSONIA — In a scene sadly repeated in many rural communities of late, a local congregation in Darke County has held its final church service and will shut the doors to its sanctuary. Following that Sept. 30 service, along with the resignation of its 44th pastor, Rev. Lowell Miller, Ansonia Christian Church announced it would close, ending a 161-year tenure, beginning with the church’s founding in 1857. In that first year, 42 people gathered at a school house north of Ansonia, then called “Dallas,” to establish a place of worship. The first church structure, built in 1861, was called the Christian Church of Dallas then became the Christian Church of Ansonia, as the village’s name changed. The current church building was constructed in 1893. Over the years, the church was active in the Ansonia community, holding a women’s fellowship, adult and youth choirs, AWANA, as well as staging election day suppers and Easter Sunrise and Christmas Eve services. The resignation of the pastor, declining attendance and the age of its members are among the reasons Ansonia Christian Church decided to close its doors. A few weeks after its final worship service, Joyce and Don Walters, members of the church for 62 years, allowed The Daily Advocate inside to photograph the church’s sanctuary and stained glass windows, their vibrant colors aglow with morning sunlight. “It’s like our family now,” said Don Walters, who served as the church organist. In addition to many worshipers growing older, there is an overall trend of declining church attendance in the United States. A Pew Research Center survey (https://pewrsr.ch/2KmGbhK) conducted Dec. 4 to 18, 2017, shows while many Americans maintain faith in Christianity, they don’t necessarily see church attendance as essential to practicing that faith. Of those adults surveyed who never or rarely attend services, the survey found 37 percent saying they practice their faith in others ways, 28 percent saying they are not believers and 23 percent saying they have not found a church they like. Among the Ansonia Christian Church faithful, there is shared a sentiment that American society has not only abandoned God but forsaken church on Sundays in the pursuit of other interests. Rev. Miller echoed that sentiment. Connie Michael, the church treasurer, has attended Ansonia Christian Church since she was 8 years old, more than 70 years ago. Don Walters, Joyce Walters and Michael all said they are still in the process of choosing a new church to attend. “We all have,” Joyce Walters added. Although the closure of Ansonia Christian Church brings sadness for its members, there is a ray of heavenly sunlight among the clouds, as the building will neither be sold nor abandoned to the elements. Nearby Ansonia Church of God has voted to accept ownership of the church property, with plans to use the building for a youth outreach ministry. Final details of the transfer are pending. While the closing is bittersweet, Joyce Walters said she is nonetheless happy knowing the building will continue to be used for a Christian function. “I’m thankful another church is taking over the building and it will continue to be used to the glory of God,” Rev. Miller added. This entry was tagged Ansonia, Ansonia Christian Church, Ansonia Church of God, church. Bookmark the permalink.